Heaven’s Vault is a game like nothing else I’ve seen. 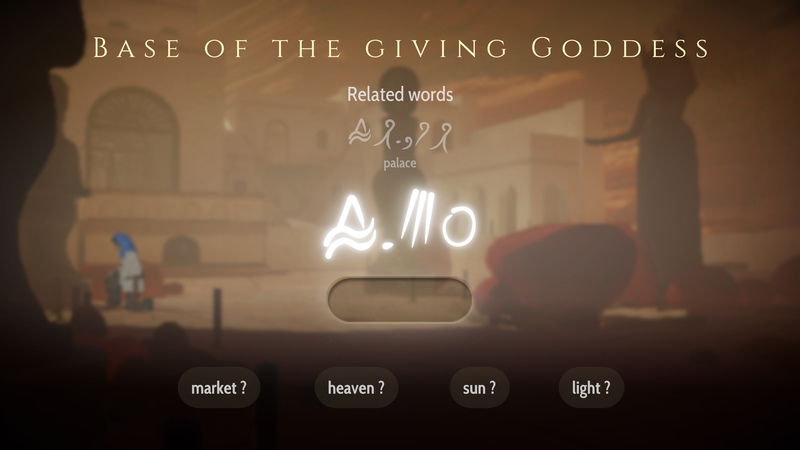 Some puzzles are based around grids like The Witness, others around spacial awareness and manipulation, like Portal, but Heaven’s Vault is based around language. That doesn’t mean that it’s a crossword or word search, where the goal is to find a word you already know. Instead, Heaven’s Vault is about discovering, translating and understanding words you don’t. When the game begins, you’re shown a few short sentences to try and translate. The game offers you a couple of potential translations for each word and you can start to examine the alien text. It is nothing like the Latin alphabet, with beautiful, swirling and flicking strokes dancing across the screen. I would say it likes more like Arabic, but not knowing the language at all, that is just my interpretation. Either way, it looks lovely and unfamiliar. There is no Rosetta Stone in the Nebula, nor are there any Youtube guides to teach you the basic forms and functions of the other language. This means that a lot of the early game is spent guessing at the words you’re trying to understand. There’s next to no punishment for getting anything wrong and the game will give you ample opportunity to correct your mistakes, but that doesn’t mean that it is simply a guessing game either. Related We. The Revolution Review – What Kind of Judge Will You Be? Students of language can start to interrupt the shapes and letters of the alien text, finding meaning in repeated forms that make up the game. I attempted to do this, but it’s safe to say that I’m no linguist. Still, you can start to theorize about certain unknown words, like the word for fire and water having an identical beginning and end, which can help translate other words that have the same format. But for those of us who aren’t gifted with translation, Heaven’s Vault is still a beautiful deductive tool. Instead of studying the letters, you can study the environment for clues as to what each word might mean. The puzzle solving in this game makes you feel like an anthropologist, and it’s a really satisfying experience. Whether you’re breaking down the sentence structure or searching through some old stones, you’ll feel like you are making discoveries and connecting to these lost civilisations all the time. Wandering the worlds and moons you land on, looking for secrets about the place that would explain the lost language you’ve found is wonderfully subjective, allowing a lot of interruptions that you must weight up against each other. One early location has a giant ancient statue dedicated to a lost goddess, but you have to work out what her divine responsibilities were by looking at the world, talking to the locals, and your robot sidekick, and looking for other uses of the word. The world of Heaven’s Vault is shrouded in mystery. Old ruins scatter the many moons that float idly in the intriguing Nebula, that once formed an ancient empire. 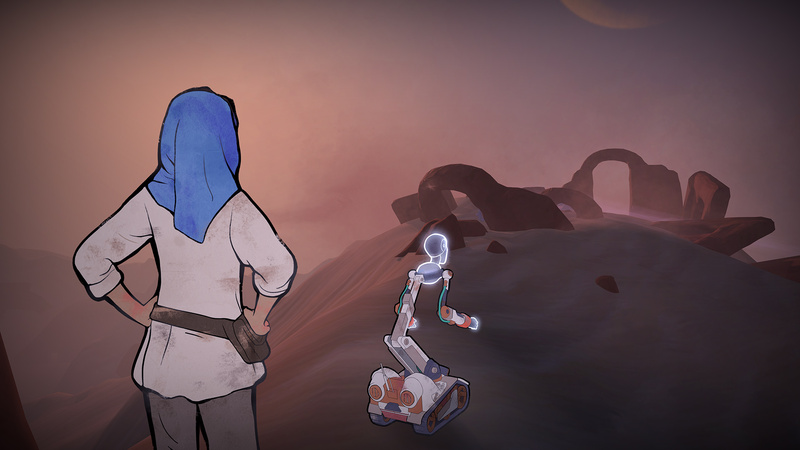 Players take the role of Aliya, one of the few historians in the Nebula, who is searching for her lost colleague. Uncovering the long lost history of the world is heavily tied to the translating puzzles, as the artifacts and ruins you come across slowly thread a tapestry of the people who came before. The story is really engrossing once it gets rolling, as you chase your colleague through the bewildering Nebula and its forgotten architecture, simultaneously searching for answers in the present and the past. All the while, Aliya and her robot sidekick Six can have extensive conversations that help flesh both of them. 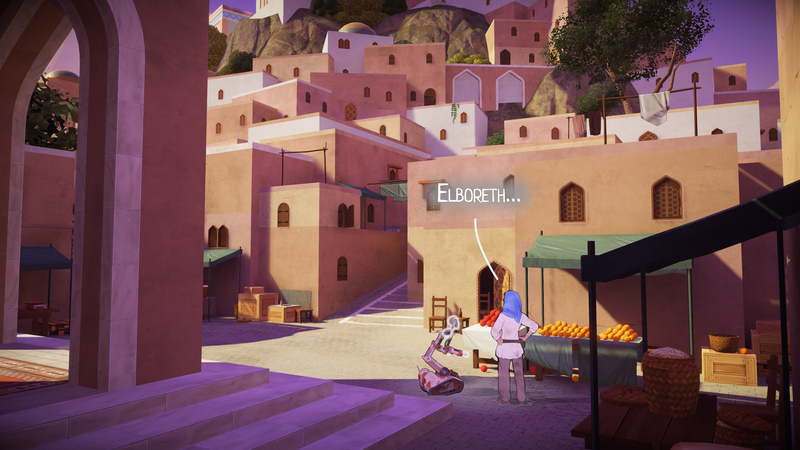 Players can help define Aliya’s personality through dialogue options, but there is a real sense of depth to these characters and the world around them. These conversations can also be useful context clues for area, and the words scrawled upon it. You can tell this is from the studio that made 80 Days, with its fantastical world, deep characters and interesting conversations. The language itself feels so vast that you could have actual written conversations in it if you can decipher enough of the words, and all the way through the story you feel you are just scratching the surface of the lost empire, its language, culture, and history. But beyond the words, the art style itself is amazing. The entire game looks hand drawn, with character animations appears as smoothly transitioning still pictures. Even without the entirely unique puzzle style, the game would still be worth exploring if only to see its alien landscapes and beautiful design. There are a few issues, however. The Nebula may be a strange and lovely setting, but traveling between its many moons is much less interesting. Players must man a boat that sails across the interstellar rivers that connect the worlds, but doing so is somewhere between relaxing, tedious, and at times annoying. Although Heaven’s Vault does allow you to backtrack if you’ve missed a turn, it can still be a pain, and an overly long experience, navigating the space waters. When the puzzles and environment are so worth exploring, this aspect of the game just feels like it’s taking you away from that for too long. And while the conversations might be interesting, it can be a little bit difficult to judge how Aliya will react to certain prompts. Not unlike LA Noire’s ‘doubt’ option, Aliya’s vague responses can sometimes have her lash out sarcastically or aggressively when that wasn’t your intention. I haven’t seen any real consequences to this, but it can break your immersion somewhat. But these faults are tiny compared to the incredible experience that Heaven’s Vault has to offer. Players can expect to labour over single letters as they try to piece together ever longer words, or take their time meandering across one moon to find all the secrets it has to offer. For anyone looking for a story-driven experience with puzzles that require lateral thinking, Heaven’s Vault might just be heaven for you too. Reviewed on PC (code provided by the publisher). Heaven's Vault is a puzzle game you haven't experienced before. From its engaging story to its engrossing fictional language and puzzles, this is a game that feels rewarding in a way that no other game has done before.